This is an expanded and revised version of an article written by Mean Mr Mustard, originally posted on the forum. For the purpose of this article, each combo described will be the crux of a pretty standard Hunting Party engine; the deck in most of these cases should be built exactly to the same specs: 1-3 Silver, 1 Gold, 1 linchpin card and as many Hunting Parties as can be massed in time to end the game in a win. 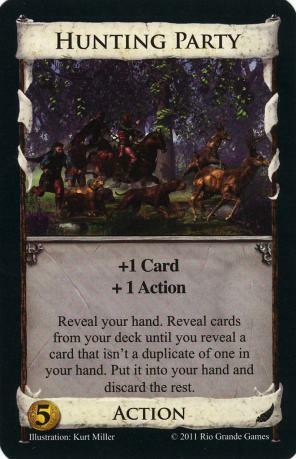 The linchpin can be described as any Kingdom card that is not a terminal draw or cycle card. These terminals will completely disrupt a Hunting Party engine and should be avoided. The idea is that the Hunting Parties leaves you with one of each unique card in your deck: 1 Silver, 1 Copper, 1 Gold, and 1 linchpin card should get you to $8 every turn provided you have enough Hunting Parties. Horse Traders is an excellent focus of a Hunting Party engine for two reasons: first of all it can help a lot to get the $5 needed to buy early Hunting Parties, and secondly it gives $2 and a buy once the engine is firing. Any $2 terminal can be used in a Hunting Party deck. Militia, Swindler etc can all be used to success but I feel that Horse Traders is a cut above the standard for the help it gives in getting the engine rolling in the early game. Adding a scheme or two to a Hunting Party deck is pure love. The deck can handle the Schemes rather well, and as a rule I never add extra engine cards to this style of deck. Scheme is the exception. I like to play the Schemes as soon as they appear, before continuing the chain. With two Schemes in a focused deck it is pretty much a given that each turn will begin with two Hunting Party plays. Typically, a Hunting Party deck can stall once too many victory cards have been added. For this reason I try to avoid Duchies as long as I can get away with it. Duchies cause a flagging Hunting Party deck to die. Secret Chamber transforms a handful of useless greens into cash. With a 5/2 opening this is awesomeness incarnate. Buy the Mandarin, put the $5 back on top and buy the Hunting Party. The really nice thing about this combo is that once the deck has generated enough cash to Province you can use Mandarin to put an extra Hunting Party on top of the deck for a jump start on the next turn. This is a very fast deck unless some serious bad luck occurs. On the typical late turn chain up to $6 + Haggler, buy a Province and gain an extra Hunting Party. This jolt of power will keep the deck running strong all the way to the end. This absolutely obliterates Envoy-Big Money 80-17 on a 4/3 opening. The fact that you can play your Monument over and over again amasses a huge wall of points that essentially forces your opponent to split the Provinces 5/3 in order to make up the difference, and even that sometimes isn’t enough. Hunting Parties like Estates, since you start off with them anyway, so you might as well get some use out of it. The Baron gets full use here: the +Buy is key for a HP deck, the +$4 is a huge jolt of money, and in the late game, Hunting Parties prefer Estates over Duchies since Estates won’t slow down the deck as much as Duchies, so the Baron’s Estate-gaining power can actually come in handy. This entry was posted in Combo of the Day, Guest Articles and tagged hunting party. Bookmark the permalink. Hunting party/secret chamber is really neat, esp. considering how crappy secret chamber usually is. Never thought of that. Note: Horse Traders gives $3, not $2, so it’s even better than Militia, Swindler, etc.! With the intended deck , you are probably going to be discarding a Copper and an Estate to it, so frequently it will only net you $2, though perhaps the article should be clarified. Ah, now I understand. But still, you might easily get Estate/Estate early, or Estate/Province late. The Baron allows you to skip Gold altogether so you can buy more Hunting Parties. Wouldn’t Steward be a natural fit as it can be used for trashing early and later provide the +2 coin (or two card) option? You don’t want to waste time trashing if you’re building a Hunting Party deck. It doesn’t help that much. Qualifier: it doesn’t help that much in a HP-engine mirror. If your opponent goes for some exotic alternative strategy though, Steward could be the terminal $2 that helps the most, as trashing Estates gives your deck more longevity. HP/Bridge is nice. For 4/3, you can open Bridge/Silver, which gives you a reasonable chance of buying HP and/or Gold in the first shuffle. The cost reduction and +buy put it on par with Horse Traders if you’re using both buys. It’s not as good at guaranteeing $5 or $6 early on, though. HP/Platinum is great. The only tricky part is getting the Platinum. HP is a powerhouse in Colony games in general, since there’s $11 in differently named treasure and you can afford a couple more turns of build up. HP/Haggler is okay. The problem is that when you buy the Haggler, you could have bought a Hunting Party. It does nothing for you in the early game. It keeps the engine going with minimal maintenance, but it slows down the setup. I think HP with tourament can be great. When you bought the first province you’ve got a good chance to draw tournament/province together. So you can get the prices quite fast and at the end you can get many duchies. I’ll be the first to admit that I’m a pretty crappy player on Isotropic. But this article won me a game when I built my deck around Hunting Party/Goons. All the copper I bought for extra VP tokens got cycled away to the land of wind and ghosts. I just played a Hunting Party / Navigator deck that worked surprisingly well. The Navigator has the $2 you need to get up to $8, and allows you to skip past the next draw if it lacks Hunting Parties. I’m sure it’s not better than some other +$2 actions, but the lowly Navigator held up in a Kingdom without other +$2 actions. Navigator is one of the WORST terminal silvers for this deck, cause when you play it at the end of your deck (as HPs often have you do), you trigger a reshuffle which doesn’t have like any HPs in it. I mean, duchess is worse… but that’s basically it. I find that the schemes DON’T really help that much (though maybe it was a function of the one or two games I had it?). HP/Outpost is good as well especially when you add cards that make you’re outpost turn better (like caravan or scheme) though Outpost is not a terminal silver the HP allows you to play your outpost almost everyturn and you can then have twice as many turns as your opponent. The HP also is not as effected by the 3 card hand as other engines are. I have found that this is one of the better uses for outpost (which is noramlly a mediocre card). I just tried this and WOW did it work! I used Spice Merchant and Bishop to clean out the deck in no time flat (and once the coppers were gone I just Bishop’d the Spice Merchant), picked up 2 golds and a silver, and by turn 10 was just mindlessly cranking out $8 hands. It was all over in 15 turns: I had 6 Provinces to his 2 and my deck was nothing more than 4 HP’s, 2 gold, 1 silver, 6 Provinces. Thanks for the article! So….how exactly did you get rid of the bishop? See Gravity’s turn 13. I trashed it when he plays his Bishop. Note: 1 of the Golds can also be replaced with a Mandarin to top deck any extra HPs.